The story began in 1956 when there was an approach made to Rev.M General Sr.M.Caterina Galieti to supply the parish of North Sunshine with a team of nuns who would be involved in various parochial activities. Following much correspondence from His Lordship Bishop Fox, it was decided to allow the establishment of the first Augustinian convent in the Parish of St.Bernadette’s Parish, North Sunshine. 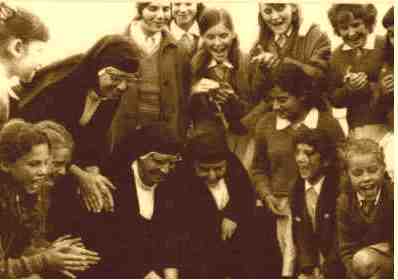 Therefore, in 1957 the first community of Augustinian Sisters, Servants of Jesus and Mary arrived in Melbourne. As many people know, beginning in a new country has its difficulties. The sisters arrived yet the convent had not been completed. Fortunately the Sisters of St.Joseph (Josephites), under the care of Sr.John Forrester, in the Maidstone community, made room in their convent for the first Augustinian community. This ‘boarding time’ was to extend to 10 months. The Augustinian Sisters are forever grateful of the kindness and assistance shown to us by the Sisters of St.Joseph. December, 1957: The sisters move into their convent at 59a Westmoreland Road. Ø Adult education for those preparing to enter the Church; marriage preparation, catechism classes. Ø Organising and leading Parish Communion services for the many times that there are no priests available for weekly mass. Since our beginnings in Australia, there have been many sisters who have ministered here in Australia.